Modeste Tchaikovsky: I've got a title for your symphony: "The Pathetic". If it really is all about you. It's so much more fitting than "The Tragic". Just "Symphony #6 in B minor: The Pathetic". Weird , bizarre story of Tchaikovsky's life . Based partially on facts , as Tchaikovsky lived as a bachelor for most of his life . 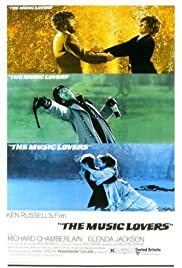 As piano teacher Peter Ilych Tchaikovsky (Richard Chamberlain) is an emotionally insecure man who struggles against his homosexuality . In 1868 he met Belgian soprano Désirée Artôt . They became infatuated with each other and were engaged to be married but due to Artôt's refusal to give up the stage or settle in Russia , the relationship ended . Tchaikovsky later claimed she was the only woman he ever loved . In 1877, at the age of 37 , he wed a former but depressed student , Antonina Miliukova (Glenda Jackson) . The marriage was a disaster . Mismatched psychologically and sexually , the couple lived together for only two and a half months before Tchaikovsky left , overwrought emotionally and suffering from an acute writer's block . Tchaikovsky's marital debacle may have forced him to face the full truth about his sexuality and he never blamed Antonina for the failure of their marriage . Tchaikovsky's family remained supportive of him during this crisis and throughout his life . He was also aided by Nadezhda Von Meck (Izabella Telezynska) , the widow of a railway magnate who had begun contact with him not long before the marriage . As The support of a wealthy widow as a patron gives him the artistic support he needs . As well as an important friend and emotional support , she also became his patroness for the next 13 years , which allowed him to focus exclusively on composition . Tchaikovsky remained abroad for a year after the disintegration of his marriage. During this time, he completed Eugene Onegin , orchestrated his Fourth Symphony and composed the Violin Concerto . The formal Western-oriented teaching he received there set him apart from composers of the contemporary nationalist movement embodied by the Russian composers of The Five (it refers to a circle of composers who met in Saint Petersburg, in the years 1856–1870 : Mily Balakirev , César Cui, Modest Mussorgsky, Nikolai Rimsky-Korsakov and Alexander Borodin), with whom his professional relationship was mixed . He was the first Russian composer whose music made a lasting impression internationally, bolstered by his appearances as a guest conductor in Europe and the United States . Tchaikovsky was honored in 1884 by Emperor Alexander III, and awarded a lifetime pension . This is an intense and thoughtful tale about a thunderous relationship proceeded in a Russel's style . As the film displays his trademarks , extreme angle cameras , excessive facial close-ups, utilization of numerous camera shots with primary colors and overblown visuals . Dealing with the tortuous struggles to have his music accepted as well as Pyotr attempts to suppress his homosexuality , experiencing serious psychological damage . In Ken Russell's own words: ¨It's the story of the marriage between a homosexual and a nymphomaniac that proved to be disastrous¨ . It's a convincing picture though relies heavily on the stormy relationship between Tchaikovsky/Richard Chamberlain and Nina/Glenda Jackson . Magnificent acting with exaggerated but convincing performances . Russell offered Alan Bates the lead role of Tchaikovsky during the filming of Women in love (1969) ; although Bates admired the script he turned the role down . Excellent main cast and secondary actors , such as Kenneth Colley , Bruce Robinson and Max Adrian as Nicholas Rubinstein , among others . Glamorous cinematography with exceptional attention to detail and captivating images by Douglas Slocombe . Spectacular musical score by Andre Previn conducting famous parts as Romeo and Juliet , overture 1812 , miniature march , dance of the clowns , Scherzo burlesque , Manfred Symphony , 6th Symphony , String Quartet No. 3 , Polovtsian Dances from "Prince Igor" by Borodin . The motion picture was well directed with flamboyance style by Ken Rusell . He's an expert director , whose greatest success was in the 70s with an offbeat musical biographies , such as 'Mahler , Lizstomania , Music lovers' , besides he directed another hits , as ¨Women in love¨ , ¨Valentino¨ and ¨The Devils¨. This outlandish biographic chronicle will appeal to Ken Russell fans.